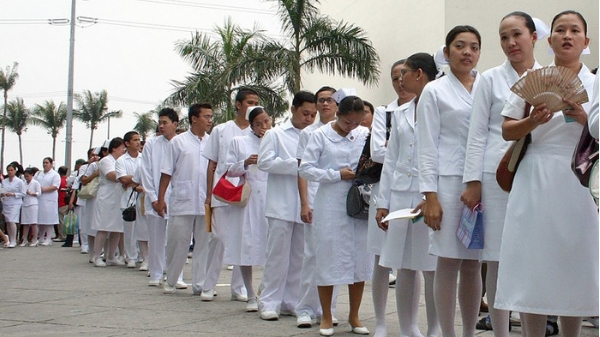 MANILA, Philippines – More than 13,000 nurses are set to be hired by the government this year as the General Appropriations Act (GAA), or the 2019 national budget, provides for sufficient funds to beef up the nursing workforce in government hospitals. Reelectionist Senator JV Ejercito on Thursday disclosed that under the GAA, funds for salaries and other financial benefits amounting to P7 billion are available for the deployment of additional 13,578 nurses under the Human Resources for Health (HRH) program of the Department of Health (DOH). Currently, there are 3,627 nurses employed by the government. "This year, the national budget allows for the hiring of 13,578 more nurses for deployment in different DOH-retained hospitals, local government unit hospitals, rural health units, and barangay health stations. Sa kabuuan, kasama na ang 3,627, magkakaroon ng 17,205 nurses sa mga ospital na pinatatakbo ng gobyerno," he said in a statement. Ejercito, chairman of the Senate Committee on Health and Demography and principal sponsor of the Universal Health Care law, had pushed, and succeeded, for the allocation of P7 billion for HRH during the Senate deliberation of the budget bill. "It's like hitting two birds with one stone. First, the additional nurses will improve medical services in government-run hospitals, and, second, 13,578 jobless nurses will be given gainful employments," he said. The reelectionist senator, as the sponsor of the DOH budget, had also restored in the GAA the P15 billion funds for the Health Facilities Enhancement Program.